The renowned spiritual writer Henri Nouwen, shares how he once went to a hospital to visit a man dying of cancer. The man was still relatively young and had been a very hardworking and generative person. He was the father of a family and provided well for them. He was the chief executive officer in a large company and took good care of both the company and his employees. Moreover he was involved in many other organizations, including his church, and, because of his leadership abilities, was often the one in charge. But now, this once-so-active man, this person who was so used to being in control of things, was lying on a hospital bed, dying, unable to take care of even his most basic needs. Despite his exceptional pastoral skills, Nouwen, like any of us in a similar situation, was left rather helpless in the face of this man’s plea. The man was undergoing an agonizing passivity. He was now a patient. He had once been active, the one in charge; and now, like Jesus in the hours leading up to his death, he was reduced being a patient, one who is ministered to by others. Nouwen, for his part, tried to help the man see the connection between what he was undergoing and what Jesus endured in his passion, especially how this time of helplessness, diminishment, and passivity is meant to be a time where we can give something deeper to those around us. Among other things, Nouwen read the Passion narratives of the gospels aloud to him because what this man was enduring parallels very clearly what Jesus endured in the hours leading up to his death, a time we Christians entitle, “the Passion of Jesus.” What exactly was the Passion of Jesus? Jesus is passive, a patient, and in that passivity he gave his death for us. Indeed the gospels of Matthew, Mark, and Luke can each be neatly divided into two distinct parts: In each gospel we can split off everything that is narrated until Jesus’ arrest in the Garden of Gethsemane and call this part of the Gospel: The Activity of Jesus Christ. Then we could take the section of the Gospels that we call “the Passion” and call that section: The Passivity of Jesus Christ. This would in fact help clarify an important distinction: Jesus gave his life for us through his activity whereas he gave his death for us through his passivity. Hence: Up until his arrest, the gospels describe Jesus as active, as doing things, as being in charge, preaching, teaching, performing miracles, consoling people. 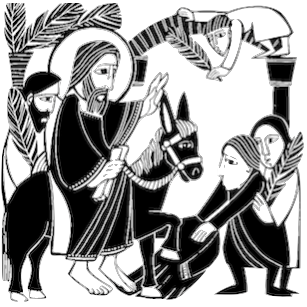 After his arrest, all the verbs become passive: he is led away, manhandled by the authorities, whipped, helped in carrying his cross, and ultimately nailed to the cross. After his arrest, like a patient in palliative care or hospice, he no longer does anything; rather others do it for him and to him. He is passive, a patient, and in that passivity he gave his death for us.